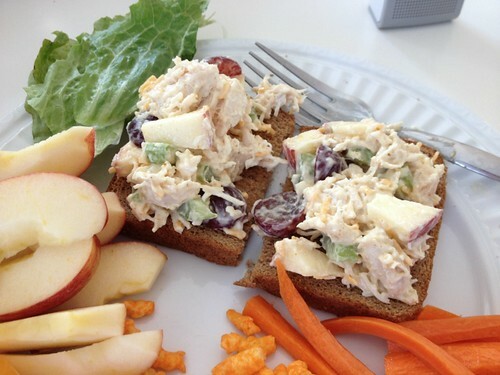 One of my most favorite “grown-up” lunches to eat at home is chicken salad. 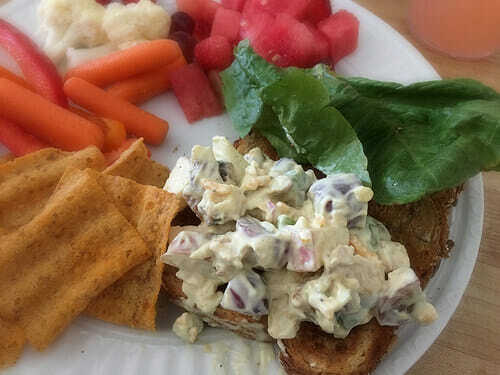 That said, I’m the only one in my family who like chicken salad, so I often make up a small batch at the beginning of the week and enjoy this quick and easy lunch 2 to 3 times throughout the week. 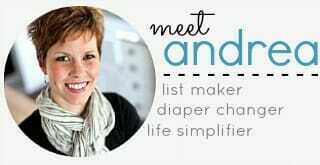 It’s SO handy when I’m trying to refill sippy cups, scoop my strawberries, wipe sticky fingers, and clean up the lunch dishes every afternoon. I literally have no excuse not to sit for a least a minute or two and enjoy my already-prepared chicken salad. I’m often asked for my “recipe” — but the trouble is, I’ve never really used a recipe to make my chicken salad. I just go by how it looks and how it tastes, then add more of something if I feel like it’s missing something. So today, along with sharing my own personal favorite recipe for chicken salad, I’ll also share some basic guidelines for making chicken salad — which will hopefully enable you to find your own “perfect” recipe! 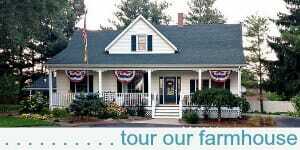 The steps and guidelines below are written in the order I add the ingredients. I always end with the sauce and seasonings so I can add more or less depending on how many other ingredients I added. I strongly encourage you to just play around with different ratios of ingredients to find the recipe you love best! 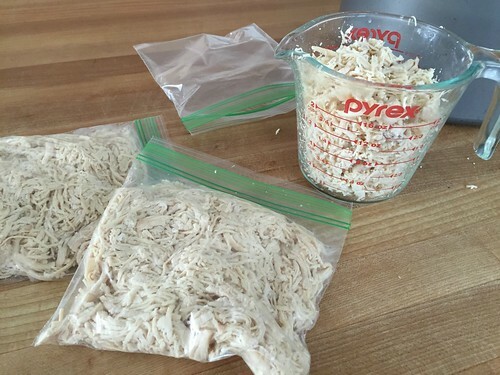 I personally like using shredded chicken for my chicken salad — because I think it “sticks” to the sauce better and is easier to chew. However, any type of cooked chicken will work. I’ve heard that a good rule-of-thumb is to use a 1/2 c. of shredded chicken per person — but in my opinion, that seems like A LOT of chicken. I like to add lots of extras so I probably lean more towards 1/4 c. of shredded chicken per person. Either way, you definitely don’t want to forget the chicken! 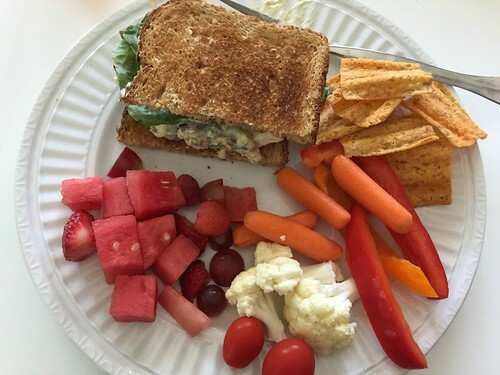 I LOVE the crunchy aspect of chicken salad, so I might add more crunch than most people… so again, just play around with it and see what you like best. 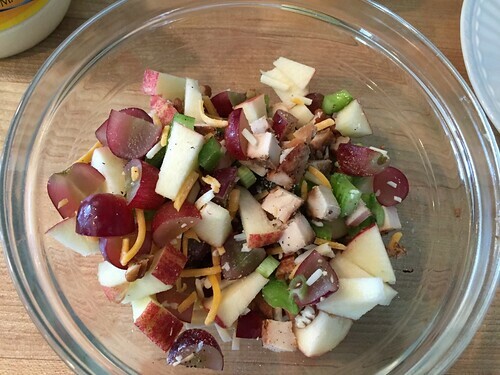 Celery, green onions, pecans, apples, and grapes are my favorite ways to add crunch — I often add all of them! I know some people who add pickles or pickle relish — but I can not stand the taste of pickles, so I never do this. Apples and grapes definitely add sweetness, but I love adding Craisins too. 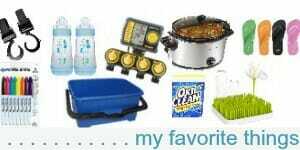 I’ve seen many recipes that include raisins and even pineapple with rave reviews. I’m not sure if savory is the right word — but I liked how it fit with my other S labels below! 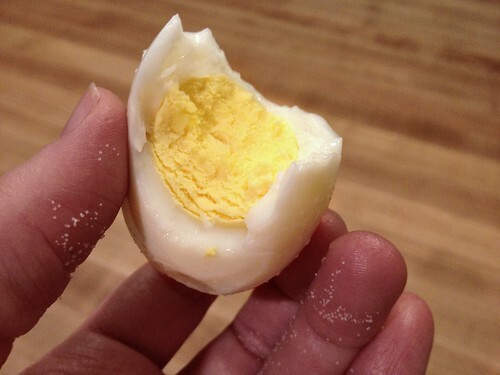 I like adding a hard boiled egg to my chicken salad — and I also always add a little shredded cheese. I know the cheese is not a “normal” ingredient for chicken salad, but I figure I can make it my way if I like! I always use a mayo-based sauce, but I know other who use mostly sour cream, or even Greek yogurt to save on calories. I also add in a little mustard — white Vinegar also helps loosen up a sauce that feels a bit too thick (although I prefer it thick). 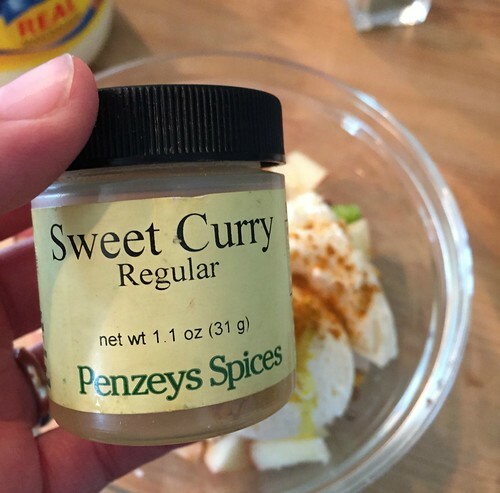 Salt and pepper are obvious choices for adding a little seasoning at the end — but I always use just a little bit of sweet curry in my chicken salad recipe. It adds such great flavor! 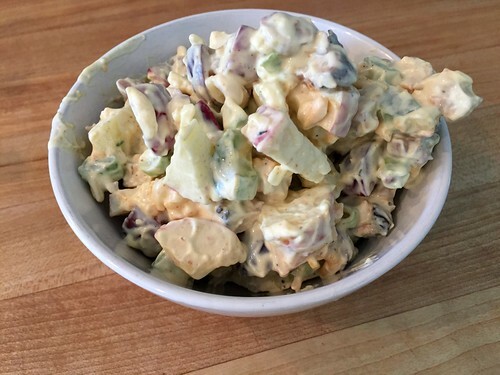 In my opinion, those are some of the “basics” of creating your own version of the perfect chicken salad… however, since I know many of you will want a step-by-step recipe to follow, I’ve included my own favorite recipe below. Please note, I don’t actually measure any of these ingredients when I’m making my salad — I just keep dumping and mixing until it looks and tastes good to me! Also, I usually just add whatever ingredients I have on-hand, so I certainly don’t always make it exactly like it’s written below! This is a smaller recipe that would most likely make 2 sandwiches or wraps. In a small bowl, mix all “chunky” ingredients. Add mayo, mustard, and any seasonings until it’s the consistency you like. Taste-test and add more of anything you think necessary. Like I mentioned above, chicken salad is one of my most favorite lunches. Not only is it delicious, it’s also so easy to make ahead with whatever ingredients I have on hand. What’s your favorite chicken salad ingredient? Growing up I hated chicken salad but in college I babysat for a family that made the best chicken salad. Her secret was using Greek yogurt. Other than that what I add is very similar to your recipe. People always ask for my recipe and are usually disappointed when I tell them I just add stuff until it looks right. hmmm….I almost always have greek yogurt in the house too — I’ll need to try this next time. Thanks! I make my chicken salad with shredded chicken, crushed pineapple (no juice), almonds or pecans, mayo, salt and pepper. It’s amazing. Even my husband loves it and he doesn’t normally like that type of food. 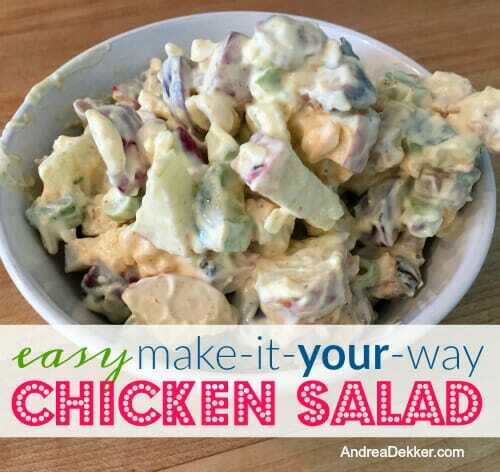 I was hoping you’d post a chicken salad recipe after reading your lunch post- thanks! It gives me some great ideas! sounds simple — I might have to try the pineapple again! YES! definitely make it ahead. I usually make a small batch at the beginning of the week and eat it 2 – 3 times during the week. I’m not an expert, but I feel fine leaving mine in the refrigerator (tightly sealed) for 4-6 days. The curry sounds interesting! This is one of my favorite things to eat. 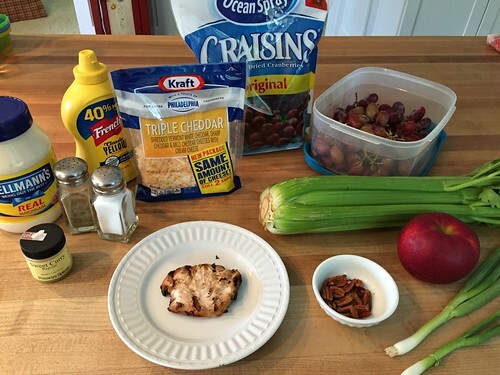 Tuna, mayonnaise, cubed cheese, walnuts (toasted – optional), apples chopped small, craisins. It is absolutely delicious! I’ll have to look it up. Thanks! Thanks Lorrie! and SO glad the lunch ideas have been helpful! 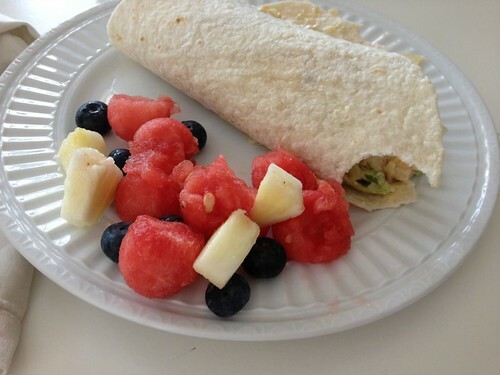 Sometimes lunch is my least favorite meal of the day because it can get so boring! It’s nice to have simple options! I worked at a bistro during college where the chicken salad was made with pineapple, pecans, and ground ginger. It was so yummy! Thanks for this, the timing is perfect! I had chicken salad at a deli recently and thought, “This tastes so much better than what I make.” So I’ve been meaning to try to make a new version at home. The deli version was made with pineapple and I can affirm that it was delicious. pineapple is good — I just usually don’t have small quantities of it ready to go for chicken salad. In my opinion, canned pineapple is better than fresh — the crushed kind so it’s nice and small. I love chicken salad too! My favorite right now is mashed avocado for the “sauce” and diced cucumber for the crunch (I love crunch but not a huge fan of celery). Sometimes I’ll add black beans & salsa to change it up too. wow, I’ve never considered avocado as the sauce. I have added it in chunks to the mixture or sliced on top of the bread, but never as the sauce. 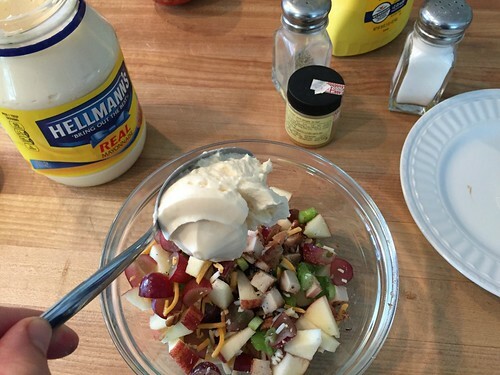 Instead of mayonnaise I like to use Miracle Whip salad dressing and add a little minced onion. If I don’t use celery I’ll add celery seed. I definitely like a little pickle or dill relish added in as well. Your recipe sounds delish will the addition of sweet…I think I may try it. I have leftover rotisserie chicken from dinner last night. I think I’m going to go mix up a small batch of chicken salad for breakfast. Hey why not, right? I’m going to have to try the sweet curry. I’m so glad you have always provided a step by step with measurements for those who prefer it, yet encourage us to just experiment. Thanks Jane — always trying to make it simple for readers!! And yes, the sweet curry is amazing!